"The greatest Horse that ever lived…"
Joey is the farmboy’s friend who is bought at market, conscripted into the Army, is lost and battered through terrible ordeals on the Western Front before a triumphantly happy ending. Warrior is the charger the General bred and rode himself for over thirty years including through all the major battlefields of the Western Front. He was an equine hero who had grooms and batmen to look after him and whose other riders, then and later, included Judges, Field Marshalls, jockeys and even my mother when her arms were feeling strong. Very different worlds. And yet their single most attractive quality is one that is equally shared. It is the simple, unspoken, uncomplaining nobility of the horse from which men and women have drawn such inspiration down the ages. Warrior may have been at the head of the column not in the ranks, but that only made him more of a target. He may sometimes have had a roof over his head rather than the open sky, but it remains a miracle how he survived all four years of the war from Ypres, to the Somme, Passchendaele, and Cambrai before finally himself leading a cavalry charge which crucially checked the great German offensive in the spring of 1918. 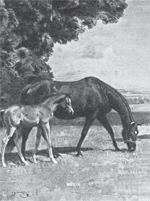 The date was 30th March – four years to the day he went on to win the Lightweight race at the Isle of Wight point-to-point. 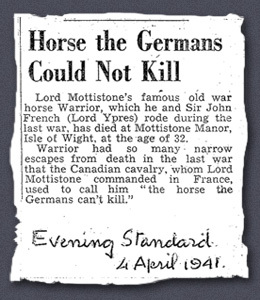 Not for nothing did the Canadian cavalrymen whom he led dub him “The horse the Germans couldn’t kill”. His story is one of its time and is quite inconceivable now. The book is also written in the argot of the period by a man who epitomizes all the old Imperial ‘King and Country’ certainties which seem so outdated now. But at the core of the tale is a belief and a truth that has been worth proclaiming since we humans first tried to form a partnership with our four-legged friend. It is that some of the greatest experiences in history have been achieved from the back of a horse. © BROUGH SCOTT 2011. All Rights Reserved.